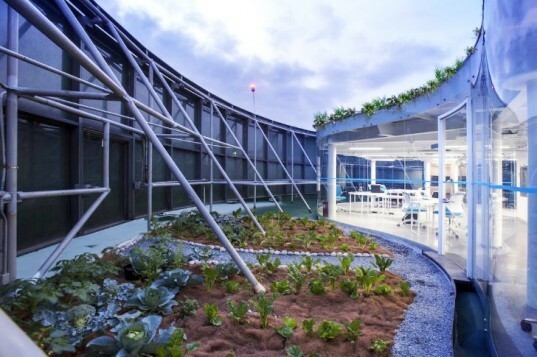 A common office tower in Mexico City received a fantastic overhaul when the underutilized helipad on the roof was converted into a co-working space and rooftop garden. Designed by Rojkind Arquitectos and AGENT, the Foro Ciel renovation created a creative, unique and flexible working space using recycled materials. 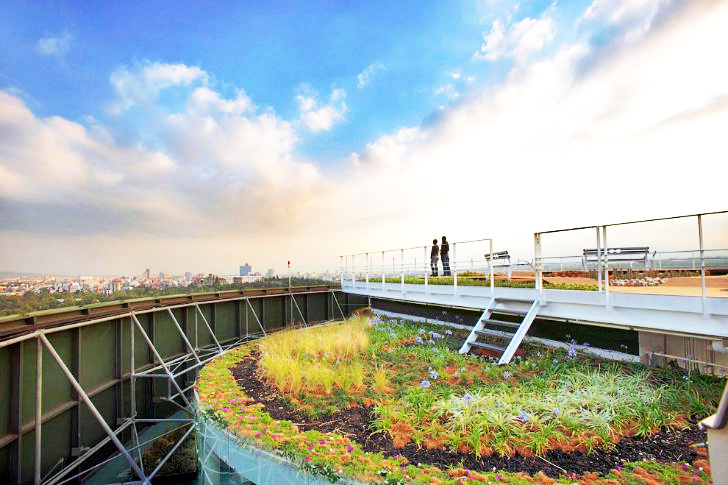 The rainwater-capturing green roof is planted with native species, and an integrated solar system generates electricity for the daylit office space. Foro Ciel is a transformative renovation project on the top of a Coca-Cola company building in Mexico City. The project, which was designed by Rojkind Arquitectos and AGENT, serves as the home of the Transformadora Ciel program. The building originally featured a helipad on the roof, but it was no longer needed and the space was transformed into a new co-working office. Furniture can be moved or reconfigured as needed depending on who is working in the space and what projects are going on. The office area’s form evolved from the available space. A protected glass volume with curvilinear exterior is topped with a rooftop garden and a meandering walkway with views out over the city. More garden areas are cultivated at the level of the office space. A 3.4 kW photovoltaic system is integrated into the design and provides electricity for the office. Offices are daylit with diffuse and indirect light as well as LED lighting. Many of the materials are locally sourced, recycled or utilize existing structural elements from the helipad. In addition, the garden’s design absorbs rainwater and retains extra water for irrigation. Overall, the project uses low-impact materials and minimizes unnecessary finishes to create a flexible and creative space. Foro Ciel is a transformative renovation project on the top of a Coca-Cola Company building in Mexico City. The project, which was designed by Rojkind Arquitectos and AGENT serves as the home for the Transformadora Ciel programs. The building originally featured a helipad on the roof, but it was decided it was no longer needed and the space could be used for a new co-working office. Furniture can be moved or reconfigured as needed depending on who is working in the space and what projects are going on. The office area's form evolved from the available space and features a protected glass volume with curvilinear exterior. This is topped with a rooftop garden and a meandering walkway with views out over the city. More garden areas are cultivated at the same level of the office space. Offices are naturally daylit with diffuse and indirect light as well as LED lighting. Many of the materials are locally-sourced, recycled or re-utilization from the existing structural elements from the helipad. The Coca-Cola Company no longer wanted its helipad, so they had Rojkind Arquitectos and AGENT transform it into a new office. Concept strategy for the transformation of the rooftop helipad into a co-working space. Sustainability strategies including solar power, rainwater collection and a native garden. Floor plan of Foro Ciel.